Does anyone else know, without even looking, that they’re probably guilty of haphazard purchasing in this category? 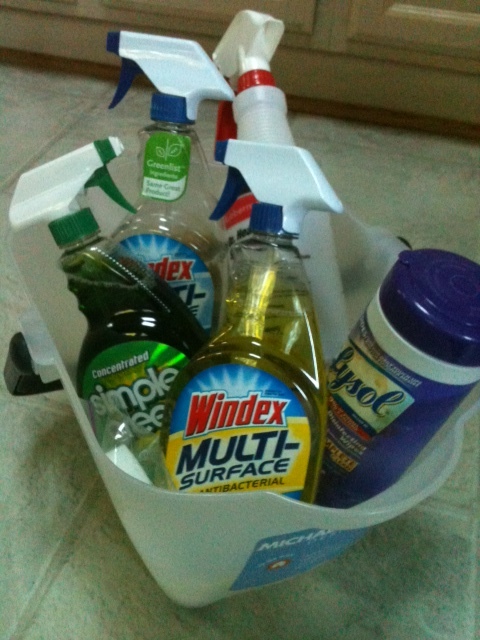 I was scared to take a look, to measure my cleaning arsenal against this list, which ranks cleaning products A through F based on the safety of their ingredients and their willingness to disclose ingredients upfront. While a growing number of my products boast “green” buzzwords, the report found that some of these still don’t tell us everything that’s in them. Full ingredient labels are not federally mandated on cleaning labels as they are on food, drug and cosmetic labels (something groups like EWG are trying to change). The Group’s researchers spent more than a year researching product labels, cross-checking some 15 government and medical databases and delving deep into companies’ websites to find their products’ contents. What did they find? More than half of the cleaning products EWG assessed contain ingredients known to be harmful to the lungs, while others contained known carcinogens like formaldehyde and chloroform. And just 7 percent of products did a decent job of disclosing contents. The only bottle I could be sure about was the one I’d filled with watered-down ammonia to deep clean the house we moved out of last spring. And with a dog in the house that licks nearly every surface in it, I should probably be a bit more careful about what I’m using (although she regularly licks bug spray off of us with seemingly no adverse effects). 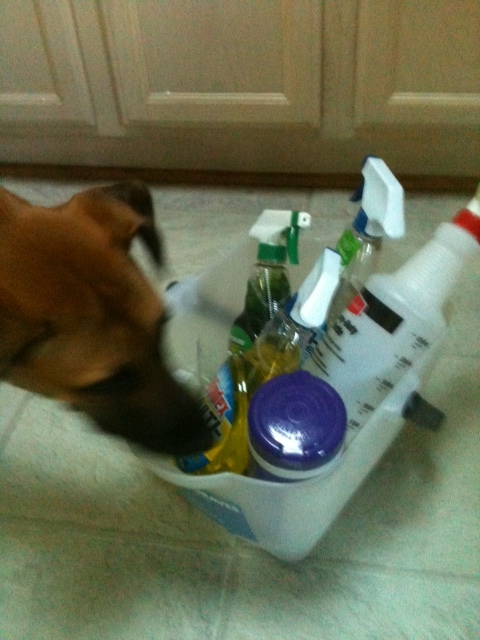 There she goes, inspecting my bucket o’ cleaning products. So how can you use this list? If you’re looking for a quick list of products that got EWG’s stamp of approval (for being non-harmful to both the residents of your home and the environment), you can find that here. 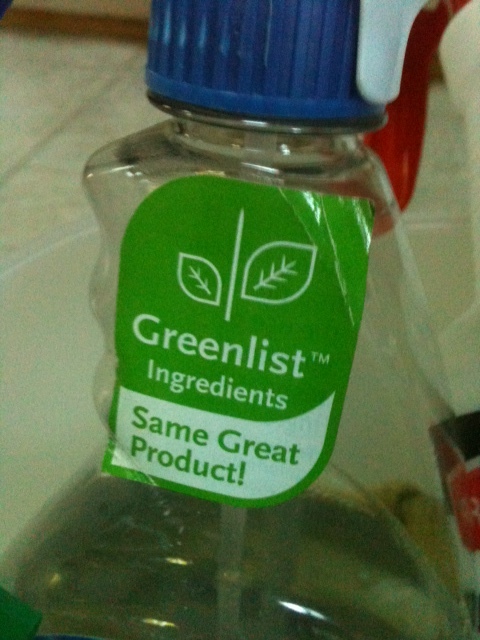 Upfront, they recommended brands like Green Shield Organic and Whole Foods’ Green Mission brands. If you’d like to analyze the spread of products already in your house, you can download the full report here. Air fresheners contain secret fragrance mixtures that can trigger allergies and asthma. Open windows or use fans. Antibacterial products can spur development of drug-resistant superbugs. Fabric softener and dryer sheet ingredients can cause allergies or asthma and can irritate the lungs. Try a little vinegar in the rinse cycle. Caustic drain cleaners and oven cleaners can burn eyes and skin. Use a drain snake or plunger in drains. Try a do-it-yourself paste of baking soda and water in the oven. Hey Whit! I’ve been thinking about doing a cleaning post on my blog soon, too. My go-to is this list of homemade recipes for cleaners (http://www.younghouselove.com/2009/10/clean-up-your-act-all-natural-homemade-cleaners/) and my stash is pretty basic: vinegar, baking soda, water, Dr. Bronner’s, and Shaklee Basic H (awesome stuff we were given for as a wedding present). I actually find this easier than having a billion different cleaners. I haven’t come up with any great ideas for dishwasher detergent, though, and still use bad store brand stuff. Its very much beneficial to be eco friendly..not only for us but also our environment…thanks for making us aware with the harmful effects of the chemicals used in cleaning products..thus eco friendly cleaning products must be preferred for cleaning. Excellent weblog right here! Additionally your website a lot up fast!